If you get to the stage where you are deploying your application on a very frequent basis and you are relying on automated tests for the bulk of your quality assurance then a mechanism to alert you when things go wrong becomes crucial. You should have something in place anyway of course but in practice I suspect that application monitoring is either frequently overlooked or remains stubbornly on the to-do list. A successful continuous delivery pipeline implementation shouldn't rely on the telephone or email as the alerting system and in this post in my blog series on implementing continuous delivery with TFS we look at how to integrate relevant parts of Microsoft's Application Insights (AI) tooling in to the pipeline. If you need to get up to speed with its capabilities I have a Getting Started blog post here. 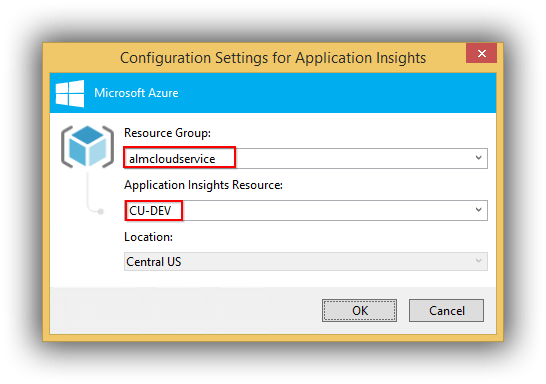 As a quick refresher AI is a suite of components that integrate with your application and servers and which sends telemetry to the Azure Portal. As a bonus, not only do you get details of diagnostic issues but also rich analytics on how you application is being used. 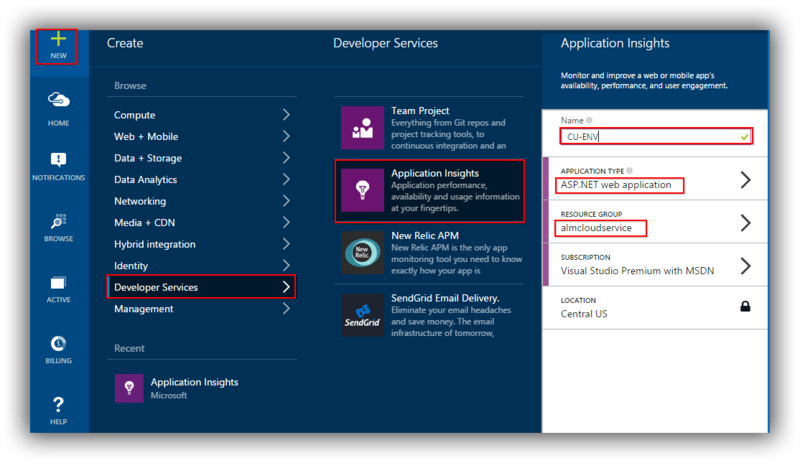 Adding the Application Insights SDK to your application. 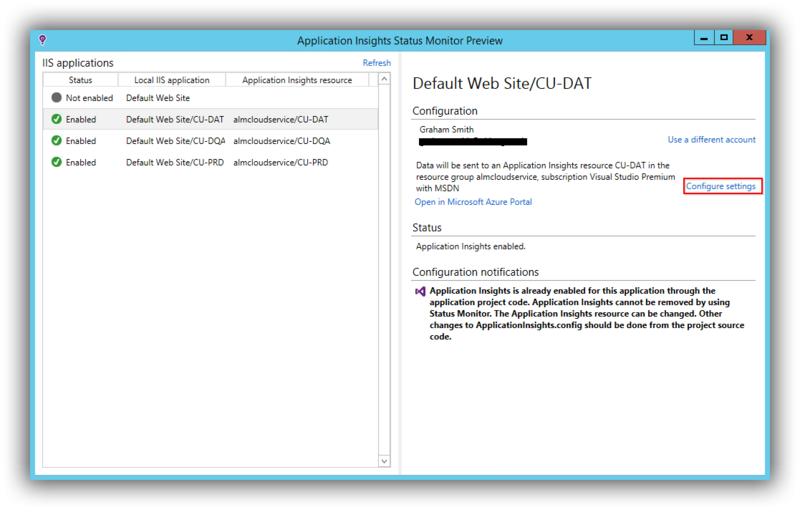 Installing Status Monitor on an IIS server. Creating Web Tests that monitor the availability of an HTTP endpoint available on the public Internet. One key point to appreciate with AI and continuous delivery pipelines is that unless you do something about it AI will put the data it collects from the different stages of your pipeline in one ‘bucket' and you won't easily be able to differentiate what came from where. Happily there is a way to address this as we'll see below. 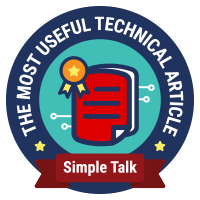 Before starting to configure AI there are some common preparatory steps that need to be addressed so let's start with those. Our sample application is now available using a URL that begins with the cloud service name and includes the website name, for example http://mycloudservice.cloudapp.net/mywebapp. Be aware that this technique probably falls foul of all manner of security best practices however given that my VMs are only on for a few hours each week and it's a pure demo environment it's one I'm happy to live with. I created the following resource groups which represent the stages of my pipeline: CU-DEV, CU-DAT, CU-DQA and CU-PRD. What differentiates these groups is their instrumentation keys (often abbreviated to ikey). You'll need to retrieve the ikeys for each group and the way to do that in the new portal is via Browse > Filter By > Application Insights > $ResourceGroup$ > Settings > Properties where you will see the Instrumentation Key selector. 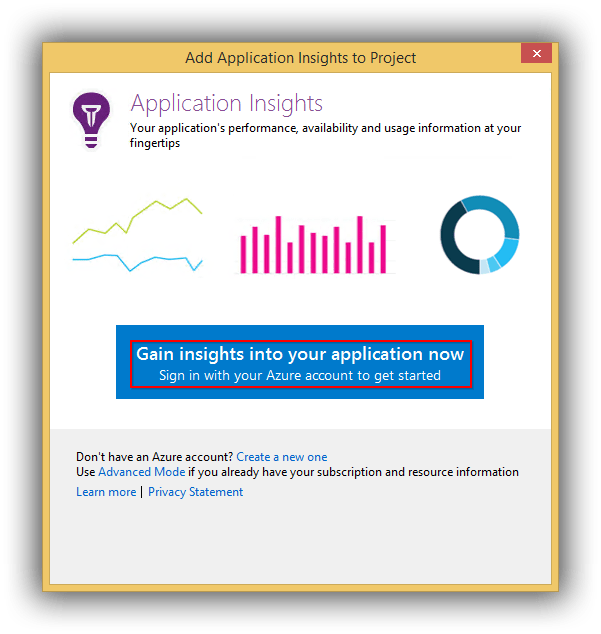 Right-click your web project (ContosoUniversity.Web) within your Visual Studio solution and choose Add Application Insights Telemetry. 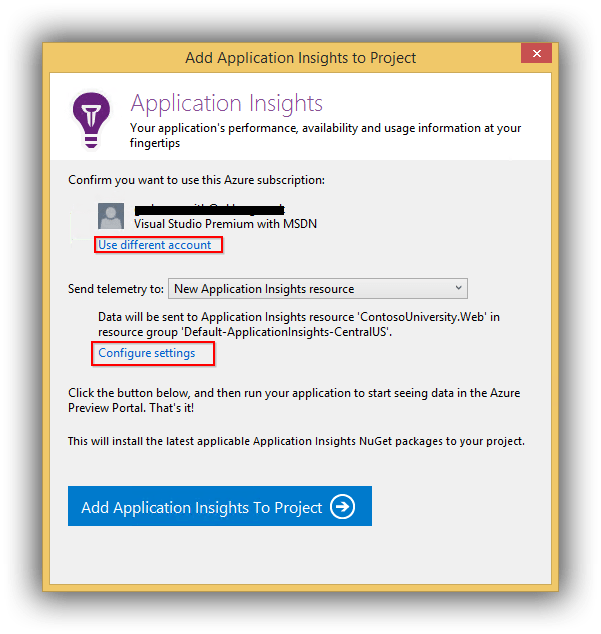 Back in the Add Application Insights to Project dialog click on the Add Application Insights to Project link to have Visual Studio perform all the necessary configuration. At this stage we can run the application and click around to generate telemetry. If you are in Debug mode you can see this in the Output window. After a minute or two you should also see the telemetry start to appear in the Azure portal (Browse > Filter By > Application Insights > CU-DEV). In the Release Management client at Configure Apps > Components edit the ContosoUniversity\Deploy Web Site component by adding an IKEY variable to Configuration Variables. Still in the Release Management client open the Contoso University\DAT>DQA>PRD release template from Configure Apps > Agent-based Release Templates and edit each stage supplying the iKey value for that stage (see above for how to get this) to the newly added IKEY configuration variable. After completing these steps you should be able to deploy your application to each stage of the pipeline and see that the Web.config of each stage has the correct iKey. Spinning up the website for that stage and clicking around in it should cause telemetry to be sent to the respective AI resource. On your IIS server (ALMWEB01 if you are following the blog series) download and run the Status Monitor installation package from here. In order to ensure that the domain accounts that the websites are running under have sufficient permissions to collect data make sure that they have been added to the Performance Monitor Users Windows local group. 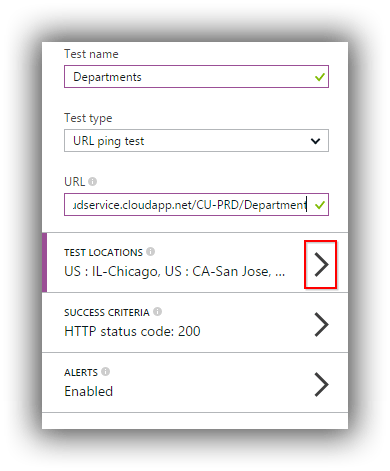 With this configuration complete you should click around in the websites to confirm that telemetry is being sent to the Azure portal. After clicking Create you should start to see data being generated within a few seconds. AI is clearly a very sophisticated solution for providing rich telemetry about your application and the web server hosting and I'm exited about the possibilities it offers. I did encounter a few hurdles in getting it to work though. Initial connection to the Azure portal when trying to integrate the SDK with Contoso University was the first problem and this caused quite a bit of messing around as each failed installation had to be undone. I then found that with AI added to Contoso University the build on my TFS server failed every time. I'm using automatic package restore and I could clearly see what's happening: every AI NuGet package was being restored correctly with the exception of Microsoft.ApplicationInsights and this was quite rightly causing the build to fail. Locally on my development machine the package restore worked flawlessly. The answer turned out to be an outdated nuget.exe on my build server. The fix is to open an Administrative command prompt at C:\Program Files\Microsoft Team Foundation Server 12.0\Tools and run nuget.exe update -self. Instant fix! This isn't AI's fault of course, although it is a mystery why one of the AI NuGets brought this problem to light.